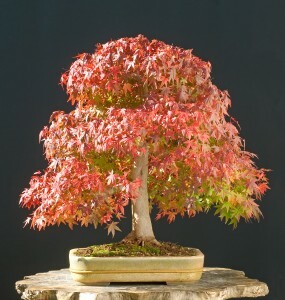 Japanese maple trees are one of the most extravagant specimens of bonsai trees regularly available today. 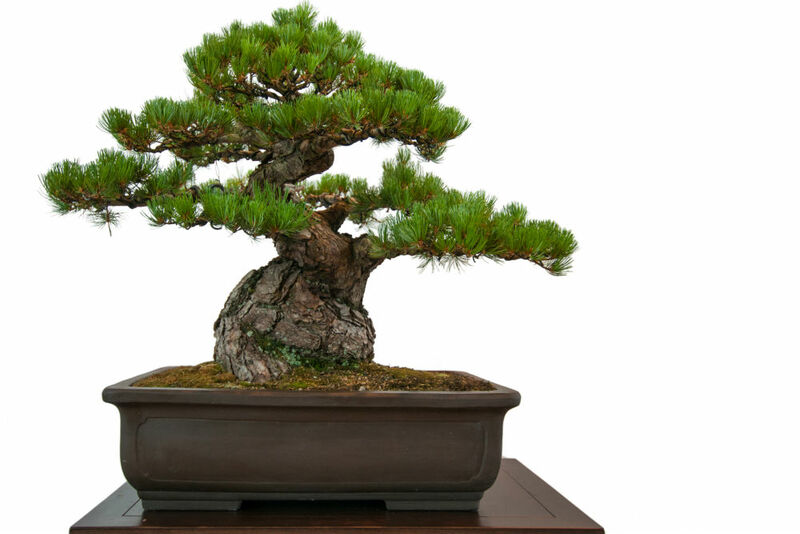 They can be grown in formal upright, informal upright, and slanting style outdoor bonsai. These trees are regularly trained as bonsai due to their spectacular colors, decent growth rate, and overall scalability. Another strong case for using Japanese maples for your miniature tree is the fact that there are many cultivators, or genetic strains, that already grow dwarfed and are easily trained. 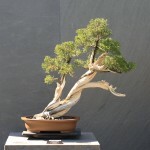 I will cover the basic strategies that are essential to understand when owning and training a Japanese maple bonsai. As always, we suggest that you check your miniature tress daily for moisture, but this species will probably need to be watered every day during the growing season, and every other or every third day in winter, depending on your soil drainage. Japanese maple bonsai are typically grown in temperate zones and need a real or simulated winter, where they can go dormant, in order to survive. For this reason, these trees are typically outdoor bonsai. This type of tree typically is grown in partial shade, but you must ensure it does get some daytime sun because this is what creates the red pigment in the fall. It is essential that you keep this tree in shady areas in early spring to prevent leaf burn. Newly sprouted leaves are susceptible to sun damage for about a week after sprouting. Leaf pruning is conducted throughout the growing season to scale back growth and balance the tree. New shoots should be pinched back in areas of the tree that do not require new growth in order to force the tree to grow in other areas. This tree can be defoliated in midsummer if the tree is healthy. This process forces the tree to grow new leaves by removing the older, larger leaves. The new leaves will grow back smaller, and thus increase the foliation of the tree. Branch pruning is ordinarily conducted in autumn after the leaves fall to avoid an abundance of bleeding. Repot this species every other year to replace the soil that has had all nutrients washed away. Maple prefer a soil with good drainage. Cut back up to one third on the roots to ensure the tree does not become rootbound. 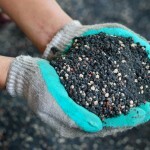 It is very important to fertilize Japanese maple bonsais with a good slow release formula to encourage vigorous growth. Feed this tree every week throughout the growing season to help encourage rapid growth. 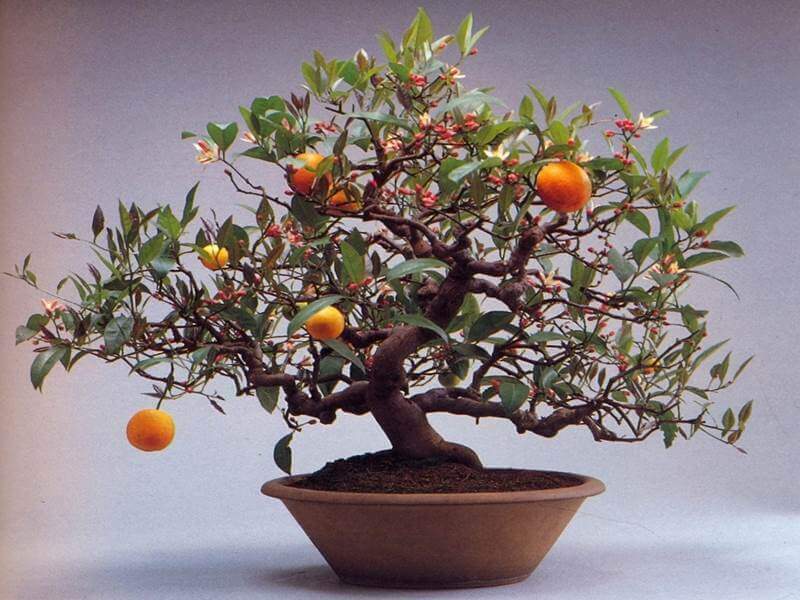 I am an avid bonsai grower with over 2500 bonsai trees growing in my backyard at all times. I was born and raised in Boston, MA where I returned after 6 years in the US Army. An inexpensive starter set of anodized aluminum bonsai wire.